(March 3, 2017) A journalist and camera operator visited our classes yesterday and interviewed Johan (the "Elektrostal American") and a couple of our students. Maria Mozhina asked Johan about the history of his interest in Russia, and how it came to be that he came to choose this particular city. Johan talked a little about how he and Judy used the differences in their English speech patterns to enrich their lessons. The two students talked about the value of the English immersion experience of our classroom and how we use a certain playfulness to enliven the classroom. Toward the end, Johan used the opportunity of the interview to thank the city of Elektrostal, a formerly closed city, for the hospitality we've experienced over the years. (August 31, 2013) Students and faculty of our Institute defied the cool, gloomy weather and occasional drizzle to march with thousands of civic groups, companies, educational institutions, sports teams, and others to observe the 75th anniversary of Elektrostal's establishment as a city. Later in the interview, I mentioned my admiration for the lively cultural life in a city that was best known for its heavy industry. I talked about my appreciation for our students at the Institute and its School of Foreign Languages, and for the founders' ability to combine educational talent and good business sense--important qualities for the country's future. When I was (inevitably) asked to compare Russia and the USA, I said that each country has its advantages. Among the things we most appreciate about our life here are--in practical terms, the very well-developed system of public transportation, and, on another level entirely, the high value Russians put on genuine friendship. Being interviewed by newspapers always makes me nervous--but this City Day interview gave me a chance to thank Elektrostal for the hospitality it has shown us for the past five years. (October 21-23, 2011) Eighteen Friends gathered in Kremenchuk to discuss the theme "The Gathered Meeting," based on an article of the same name by Thomas Kelly, which had been translated for the gathering by Friends House Moscow staffer Natasha Zhuravenkova. Johan led the opening discussion. Read more about the retreat and the theme here. (August 14, 2011) Construction began last month on an annex for the New Humanities Institute in Elektrostal, where Judy and I teach English. The ambitious plans call for uniting its three faculties (linguistics and cross cultural communication; design; tourism) in one building; right now, one full floor of an office building in downtown Elektrostal houses the design faculty. We look forward to helping inaugurate the new facilities! 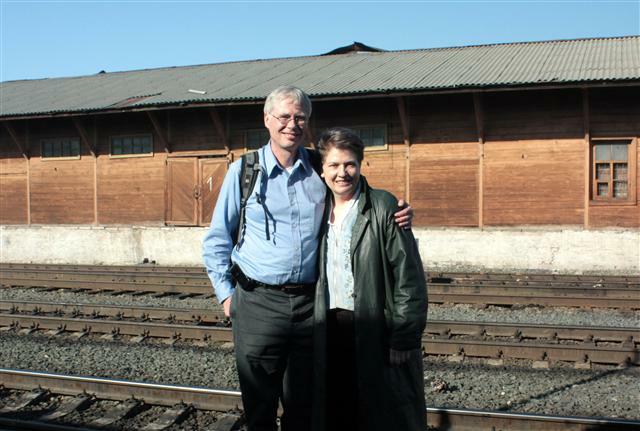 (April 2011) In 2008, Judy and I visited Buzuluk for the first time, having heard for years about the role of British and American Friends headquartered there, carrying out a massive ministry of famine relief and economic reconstruction. Last September a commemorative display of paintings by British relief worker Richard Kilbey went on display in nearby Samara, and at the same time a Russian translation of the history of those events 90 years ago, Constructive Spirit, was published. We weren't able to get away for September's events, so I was eager to get back to the region to visit our contacts there and deepen my own understanding of those events of 90 years ago. From the first moments of our arrival, our host and guide for the visit, historian Sergei Kolychev, was concerned to make history as concrete as possible. It began with our first steps off the train at Buzuluk's station--he greeted us and immediately pointed out the rails on which relief goods arrived in Buzuluk, and the location of the warehouses where they would have been stored. 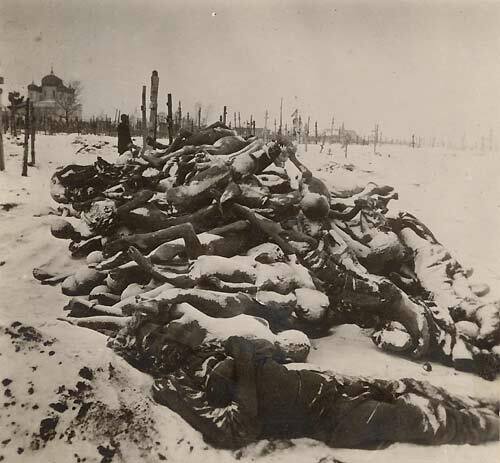 As our bus left the station area for downtown Buzuluk, Sergei pointed to the road on which the earliest relief workers reporting seeing bodies lying, dead from starvation or disease. Later, on our last full day, he took us to the old city cemetery and pointed to the area where a mass grave held famine victims. In that same cemetery, bordering on the Tikhvinsky Convent, is the presumed burial place of the schemamonk Maksim, a blind, saintly elder of the church who died in 1937 in the custody of the authorities, refusing to the end to confess to false accusations of counter-revolutionary activities. There was one bittersweet elem ent of mercy at the end of his earthly story, and it involved the spiritual gift of healing for which he had long been known. His prayerful intervention resulted in the healing of the prison director's wife, as a result of which he was allowed a Christian burial instead of the common grave into which most dead prisoners were dumped. 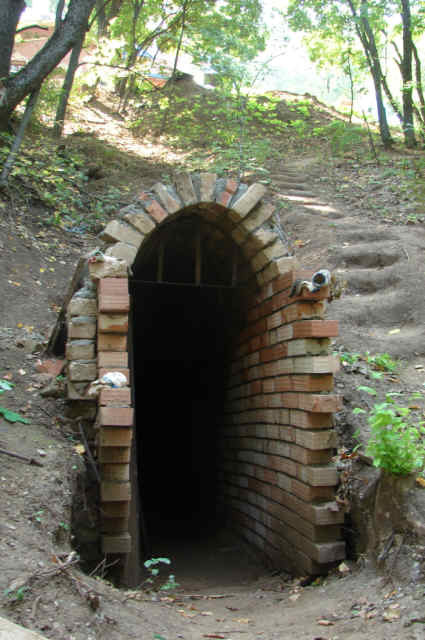 The monastery where he had served, Holy Transfiguration Monastery and its associated underground cloister (where we visited in 2008), had been confiscated bit by bit, and finally shut down completely in 1929--its facilities converted into a reformatory and its underground passages blown up. Although the prison remains, the underground cloister, capped by a new church building, is being restored--we revisited it on our third day in Buzuluk, and I was amazed by the progress made in less than three years. We walked through the restored passages and spent a moment in a freshly rebuilt chapel. Every single person who had been associated with that monastery, who had not renounced their faith, and who had not died earlier, was executed in 1937. Thanks to Sergei Kolychev's diligence in putting us in these places, supplying us with their historical context, my appreciation for Buzuluk's Calvary Walk through the twentieth century deepened. He and another historian, Nikolai Makarov (who was a crucial guide during our 2008 visit) also accompanied us to the local office of the State Archives, where we saw a Russian translation of a 1923 film made by British Friends to raise funds for the Buzuluk work. That film helped me realize something that hadn't really been clear to me before. Somehow the sheer scale of the tragedy had given me the impression that Buzuluk was an impoverished town. Yes, there was rural poverty in that part of Russia before the 1917 revolutions, but as the film revealed, Buzuluk was a modern, highly developed little city. Agriculture in that region had always been precarious, but pre-revolutionary regional governments had instituted grain banks as buffers for harvest failures. In one of our walks, Sergei pointed out the home of the man who informed Moscow that the Buzuluk region seemed to be well-supplied in grain despite 1920's bad harvest. The consequences were swift in coming: wholesale confiscations. The archive office already has hundreds of pages of archival material from American and British Friends to help them in reconstructing those sad days of local material. They asked us for help with some of the less legible handwritten photo captions; we promised to try. Sergei and Nikolai have a couple of longer-term goals--a memorial plaque, perhaps at the railroad station, for the Quaker relief mission; and a memorial book giving a full and well-illustrated account of that history in its full regional, historical, and spiritual context. 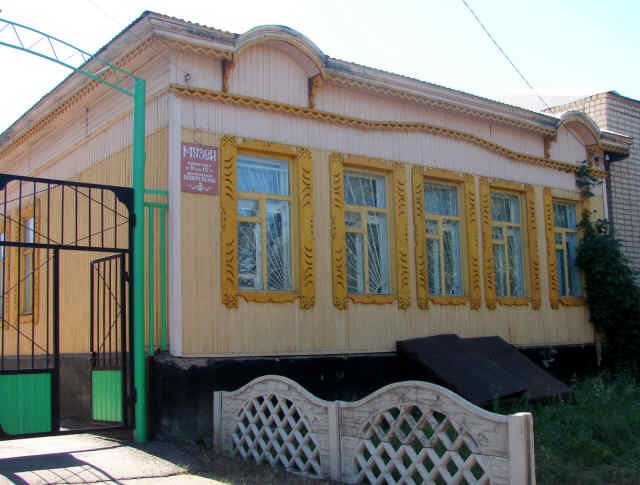 During our days in and around Buzuluk, we also revisited Sorochinsk, where we met again with the editor of the town newspaper, Liubov Mazylo, whose office is in the house used by American Friends during the famine relief mission. She and her staff interviewed and photographed us. Later, she reunited us with the priest of the Sorochinsk church, and took us to the machine shop of a local farm. 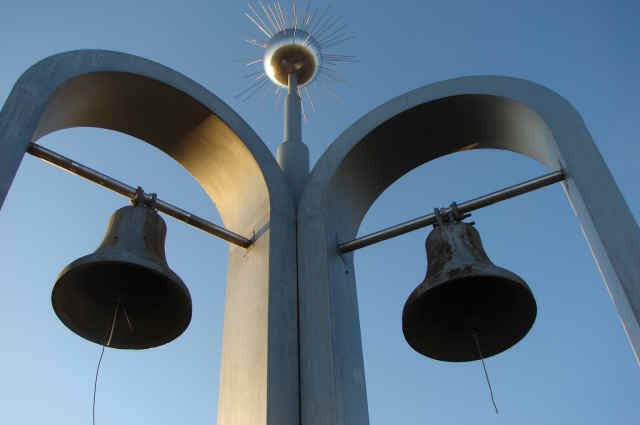 We visited the village of Sukhorechka, which appears in some of Richard Kilbey's work. 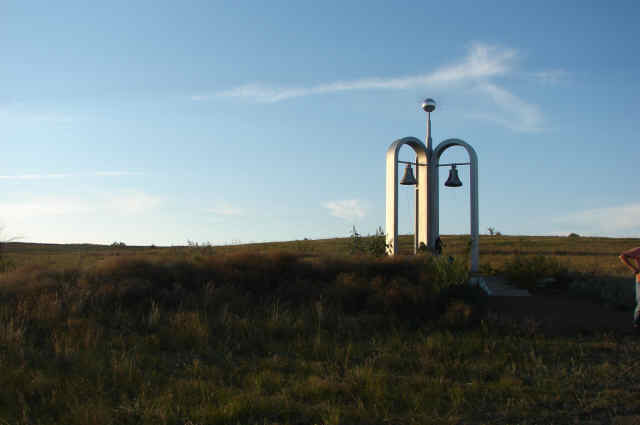 Sukhorechka's energetic and visionary priest, Father Anatoly, described his parish's plans to develop church grounds into a fruit grove for the whole community to enjoy. (March 21-25, 2011) Judy and three Friends from the Friends House Moscow board visited programs supported in part by Friends, including a school for foster parents in Dzerzhinsk and an outreach to conscientious objectors based in Kazan'. (February 3, 2011) Johan and a group of Friends from Moscow Meeting spent a wonderful evening in the company of a group of Russian Orthodox volunteers sponsored by the Danilov Monastery. The theme of the evening was Friends understanding of organizational discipline, management, and decisionmaking. (August 25, 2010.) Summer 2010 was one for the record books. For several weeks in July and August, the temperature reached heights not seen in the 130 years of record-keeping for European Russia. 100-plus (F) temperatures are not unusual in some parts of the USA, but they're extremely rare for the Moscow region, where average summer temperatures are in the low- to mid-70s, and people simply are not prepared. Air conditioning is rare. Newspapers recorded the tragic consequences of diving drunk into lakes and rivers. 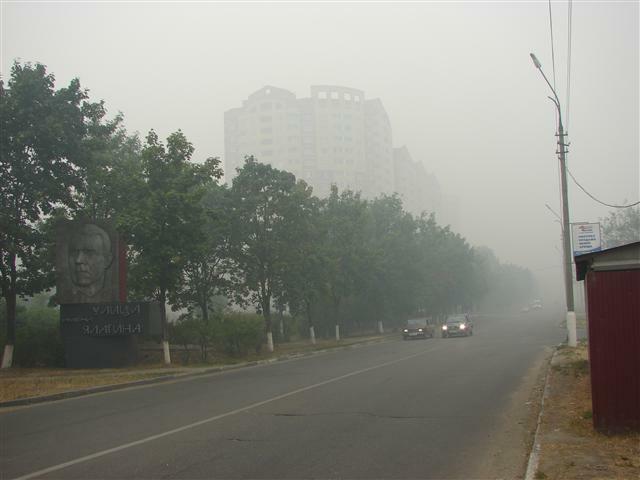 Worse yet, forest fires and peat bog fires directly killed 53 people and destroyed thousands of homes. The number of fires, and the acreage consumed, were by themselves not unusual (more fires were recorded last year, for example), but this year they struck in populated areas of western Russia. 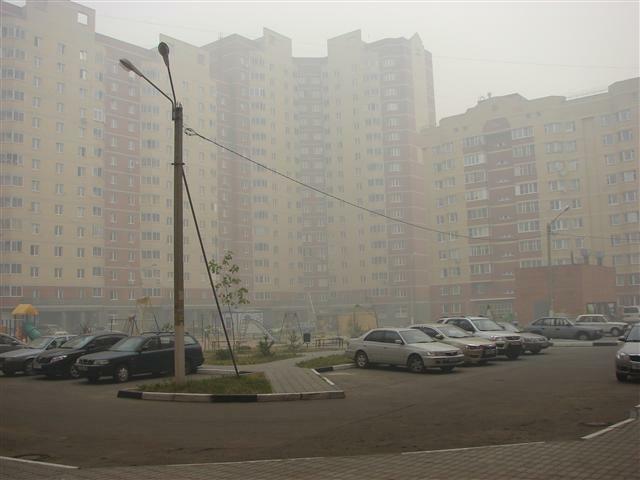 Underground fires in dried-out peat bogs sent huge clouds of foul-smelling smoke into the Moscow region. 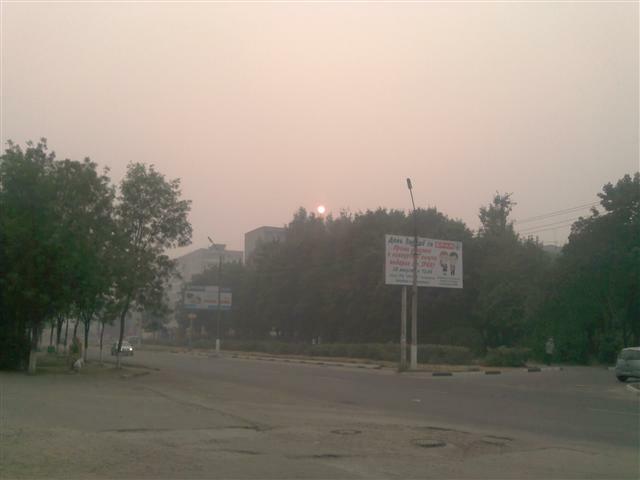 Now, a couple of weeks after the worst of these fires, I can still smell the smoke in my clothing. Above: our courtyard, viewed from our entrance. Children are following advice to stay inside. Above: Our street--notice portrait of Yalagin on our huge street sign--and headlights in mid-morning. 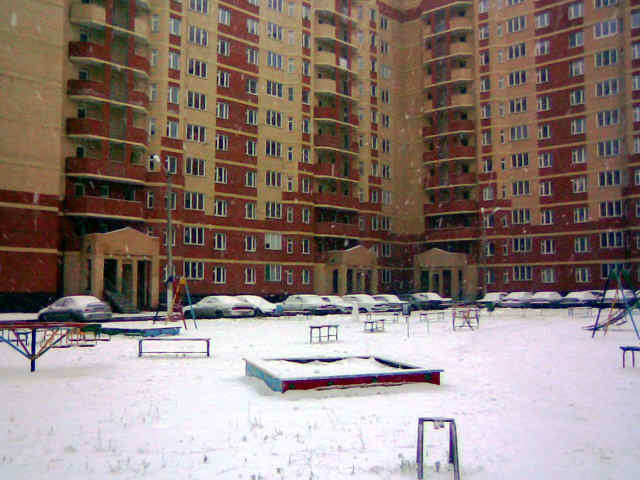 Above: Yalagin Street, across from our housing complex. The public-health effects of this unusual summer are still difficult to summarize. The numbers of deaths recorded at public morgues doubled for several days in Moscow. Economic consequences are also significant; I saw an estimate of a 20% reduction in Russia's 2010 grain harvest and a reduction in anticipated winter wheat sowing. The water table has dropped in the dacha district near our home--meaning that our friend who grows vegetables at her small dacha found last week that her bucket was hitting dirt at the bottom of her well. Living in the midst of difficult conditions that were widely covered in Western media, I was glad to get expressions of care for me and my neighbors during these days. Although I missed Judy a lot, I was also glad that she was in the USA and getting a respite from all this! 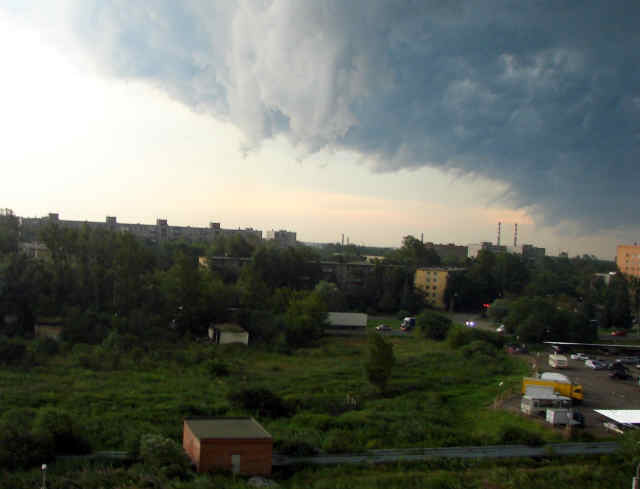 Just before my current visa renewal trip (I'm writing this in Riga, Latvia), cooler air and several thunderstorms swept through Elektrostal. Not a moment too soon! 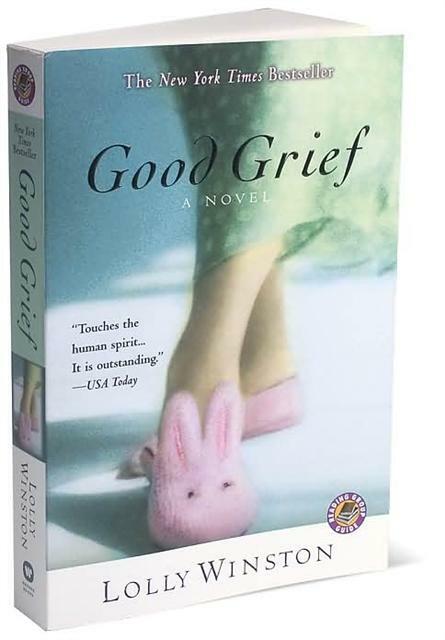 For a second year, I've used Lolly Winston's novel Good Grief in my classes. Judy helps me dramatize the dialogue and interpret the female characters of the novel, whose themes include friendship, trust, and mentorships, delivered with vivid, contemporary conversational English. 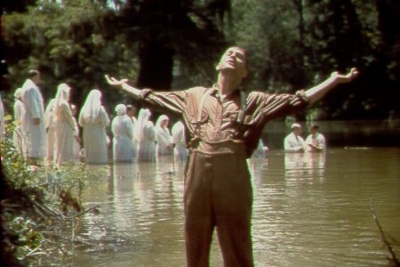 Just before the New Year break, I showed O Brother Where Art Thou in my third-year classes. Aside from the many cultural and relational themes, it shows that the USA can make better films than the usual fare imported into the Russian market. On New Year's Eve, Judy and I celebrated with the New Humanities Institute's staff in the cafe attached to the Institute's building. Our friend Nadya, daughter of two of the language department's best teachers, led us in skits and mixers, until close to the midnight hour, when all eyes went to the large-screen television. First, the traditional speech by the president, timed to end just at the stroke of midnight. Then, something unexpected: a cartoon of President Medvedev and Prime Minister Putin. 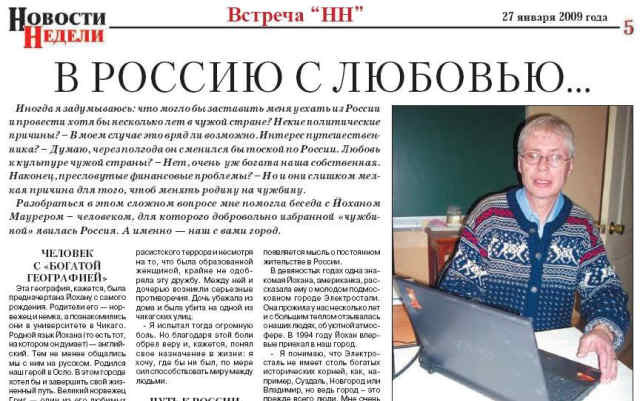 (February 1, 2009) The local newspaper Novosti Nedeli (News of the Week) published an interview with me, entitled "To Russia With Love," in its most recent issue. It was such a warm and positive article I barely recognized myself! 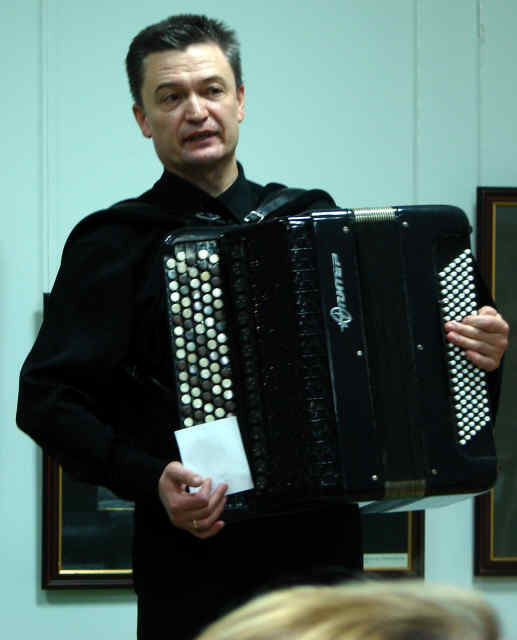 Johan has lived in the U.S., Canada, England, Germany, Norway, and finally, in Russia, and now he feels that music blurs borders, and all the lands in which he has traveled extensively seem like one great motherland. Maybe becoming a citizen of the world and getting rid of man-made frames and borders helped Johan overcome grief in his life. His sister became friends with a black girl.... His mother, a German, was brought up in the years of Hitler's racist terror, and despite the fact that she was an educated woman, she did not approve of this friendship. A serious parting of the ways developed between mother and daughter. The daughter ran away from home and was murdered on a Chicago street. "I felt a huge pain at that time. But thanks to this pain I came to realize a purpose for my life: I want, whenever possible, to the limits of my abilities, to promote peace between people." Johan is a genuine romantic--and a romantic is above all someone whose soul can catch fire from a high and wonderful idea and turn away without regret from the usual pattern of life. While still in school, he read Dostoevsky's «Crime and Punishment»--and immediately fell in love with Russia, captivated by the dream to visit the country. "I then read all the novels of your great writer. His ideas about history, about God, the soul, and human relationships became so close to me that I realized: only a great country could give the world such a unique thinker." 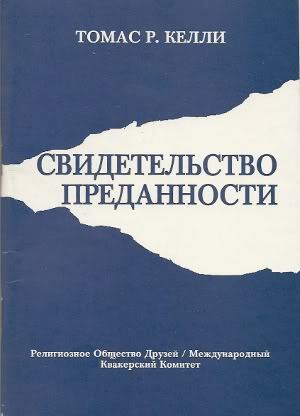 Johan began to study the Russian language. "Your language is also surprising to me. Its flexibility, its rich possibilities reflect the richness of the Russian mind." I've been interviewed by newspapers before--not always accurately! For this reason, I was very grateful that Yuri gave such a positive (accurately so!) interpretation of our hopes and motives for living among his readers. In school I taught my usual college-level classes through December. In January, the college-level students were occupied with exams, so I spent time with high-school-level students. We also visited a public school and served as jurors in an all-city English competition. Our social life revolved around two principal themes: First, the New Year and Christmas holidays--we hosted and visited several of our friends and their families (Judy did most of the cooking, I admit, trying lots of new recipes, especially for salads and soups). Second: we continued to attend concerts and art show. 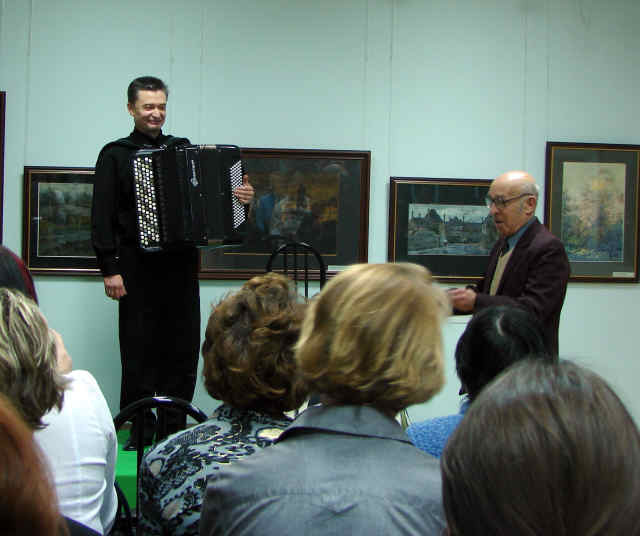 Below, Ivan Sokolov presented an amazing bayan concert on December 29 (two photos); Tatiana Vilde's gallery opening on January 22 (slide show). Ivan Sokolov and poet Leonid Biryukov; the bayan is a Russian development of the accordion. (November 24, 2008) We're back in Elektrostal after six weeks in Oregon (and a visit to Washington). We loved seeing many friends and support partners all over the Northwest, and of course we were grateful to have time with our sons in Eugene, but it was VERY good to get back to our home on Yalagin Street. And on Sunday, the wind was blowing so hard that we were just about blown off our feet, slanting the hard rain almost horizontally. We reluctantly had to give up our plans to go into Moscow for Friends meeting. On our first full day, November 13, I enjoyed working with a couple of high school classes. Last week I met with third-year and fourth-year Institute classes, and will be working with them again this week, and will also have a chance to meet the fifth-year students for the first time since the first week of September. They spent the rest of September in local grade-school classrooms, serving as teaching assistants. I'm eager to hear about their experiences; back in September, we talked about student-centered education. (I drew on my wonderful memories as a writer for Catlin Gabel School in Portland a couple of years ago). I want to see if any of the ideas we discussed were even remotely useful. Last week we talked about the U.S. elections and their outcome. In such conversations, I typically get asked what I think of the Russian president, Dmitri Medvedev. Usually, my responses are politely non-committal, since there is almost nothing I can say as a guest that actually serves a useful purpose, but this time I pointed out that both President Medvedev and President-elect Obama have deep roots in the law. I give myself permission (I said) to be optimistic that this will give them something in common on which they can build a good relationship. Sometimes the youngest students ask the most provocative questions. In a joint class with another teacher, a high school student asked what I thought was the meaning of life. After giving my answer, I was pleased that the other teacher polled the whole class, one by one. I'm looking forward to my next visit, when we will be able to build on these supremely important themes. 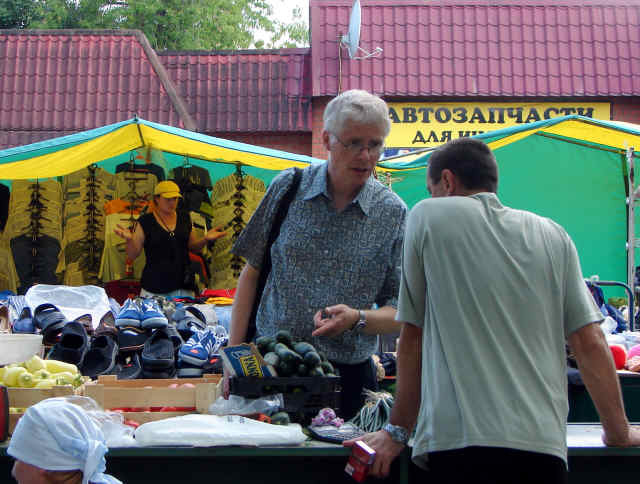 Judy and I made our first trip outside the Moscow region, visiting the region where Quaker famine and refugee relief efforts were concentrated in the years bracketing the 1917 Bolshevik Revolution, and the 1921-22 famine. In Buzuluk, the center of the British and American Quaker work of those years, we met several people who said, "The Quakers saved us." In fact, half of the population of Buzulu--that is, of those who did not flee elsewhere--died during the famine. The story is told in words and images at the regional museum in Buzuluk. It's also told in the book Constructive Spirit: Quakers in Revolutionary Russia, by David McFadden and Claire Gorfinkel, with a chapter by Sergei Nikitin. We met several of the people who helped the authors with their research in the area. We were grateful for the opportunity to renew Friendly ties with Buzuluk and other important sites of the Quaker relief work--the towns of Sorochinsk and Totskoye to the southeast of Buzuluk. One question that continues to linger in our mind: what would an ongoing Quaker presence in this historic (and now rapidly modernizing) location look like? Above: Buzuluk's clinic for children, former headquarters for the Quaker relief and reconstruction work of the early and mid-1920's. 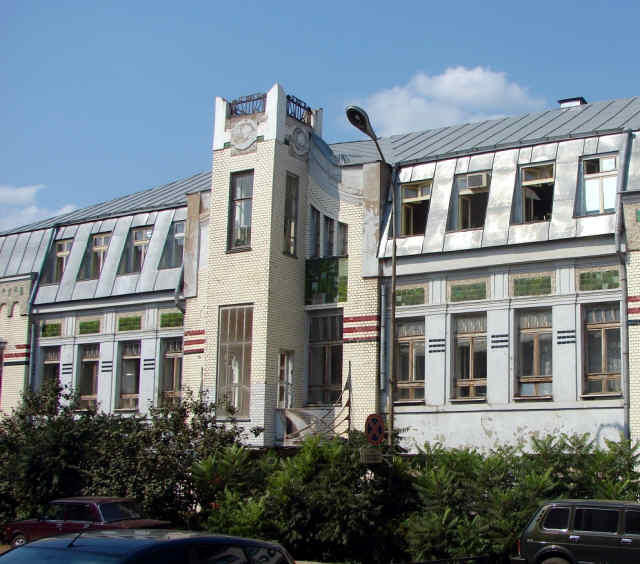 In contrast with Elektrostal, Buzuluk has many pre-revolutionary buildings, including the Pedagogical College (above), across the street from Lenin Park. 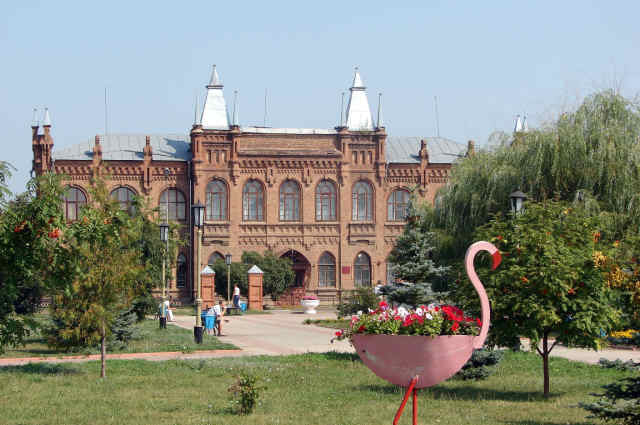 Above: the museum in Sorochinsk, population 30,000, another site of Friends work in the 1920's. Above: Just outside Buzuluk we saw a remarkable project combining spiritual and physical restoration. The Russian Orthodox monastery here, closed by the Soviet authorities in the 1930's, had included an elaborate structure of underground passages and cells for monks who chose to live in darkness, "so they could see the Light better," as we were told. Those passages and cells are gradually being restored; we walked through one long passage that has already been completed. As our first week back comes to a close, we just saw a spectacular thunderstorm sweep through town. I love this city! Each day I'm happily going about introducing it to Judy. However, without her I might never have even set foot in the outdoor market, which I've walked past all these years. WE ARE BACK IN ELEKTROSTAL!! We are thankful for a safe and uncomplicated arrival in Moscow and transfer to Elektrostal. More news soon.